Yesterday, I spiralized my first butternut squash of the season and now, I couldn’t be more excited to retire my open-toed shoes. There’s nothing better than the aroma of freshly roasting butternut squash. Well, maybe the smell of chocolate chip cookies in the oven – that’s pretty good too. 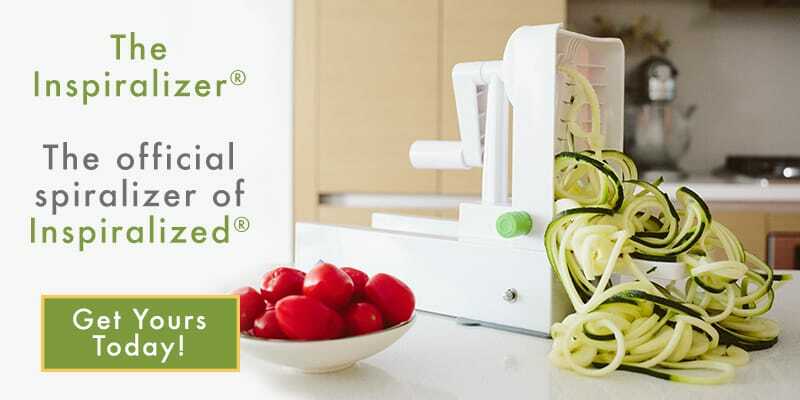 Well, with the Inspiralizer, you don’t need to soften the squash – it’s designed to tackle those tougher veggies and fruits! Here’s a video, in a case you don’t believe me. Anyway, butternut squash is so easy to cook – just roast it in the oven at 400 degrees for 8-10 minutes and there you have it: tasty, slightly sweet pasta. 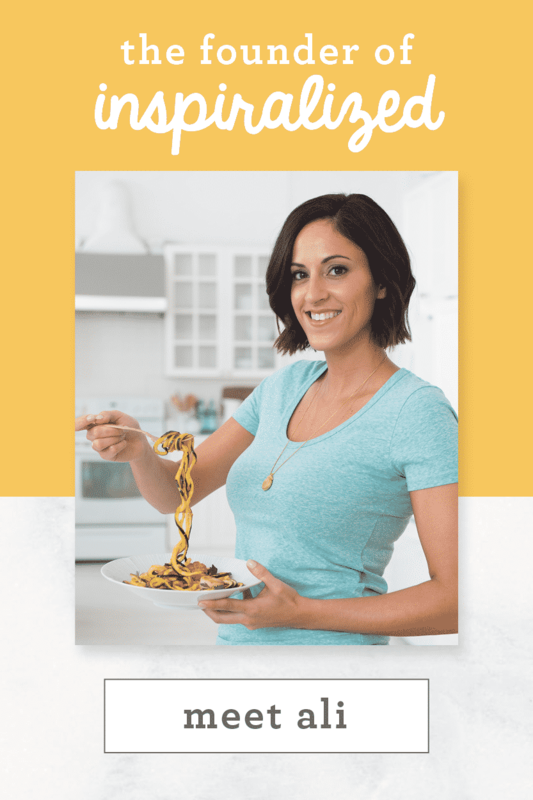 Butternut squash noodles can be tricky, because they break up easily, so don’t be discouraged if you make this bowl of pasta and your noodles don’t look like perfect spirals – it will still taste divine. 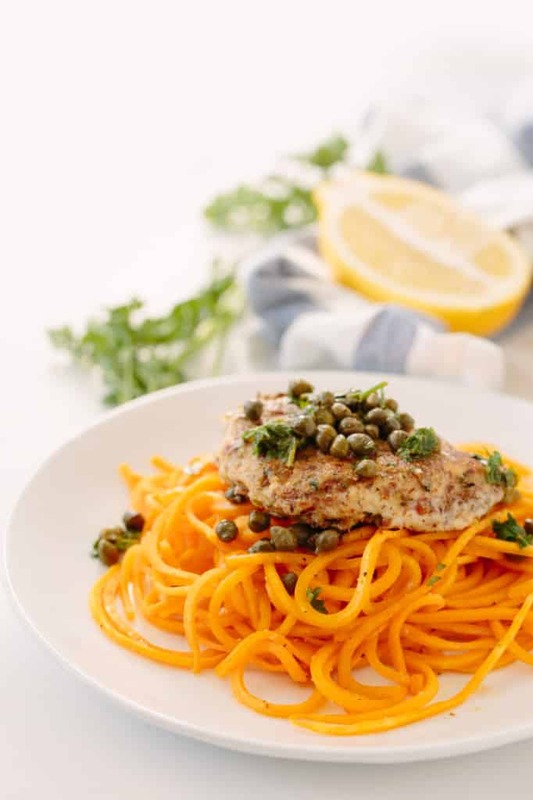 This version of chicken piccata is gluten-free and Paleo and friendly: the breading is made with almond meal, and since it’s a soft breading, it absorbs the flavors in the lemon and the capers very well. The sauce isn’t very thick, it’s just meant to lightly coat the noodles and the chicken. If you’d like to thicken it up, you can whisk in some tapioca or arrowroot powder, but I don’t find it necessary. This recipe also saves well in the refrigerator, so pack up your leftovers and bring them for lunch the next day! Preheat the oven to 400 degrees. Meanwhile, spread the butternut squash noodles out on a baking sheet, drizzle with (optional) olive oil and season with garlic powder, salt and pepper. Bake the noodles for 8-10 minutes or until al dente, tossing halfway through. While the butternut squash cooks, place the egg into a shallow dish and then combine all of the ingredients for the breading into another shallow dish, making sure to mix thoroughly. Dip each chicken portion into the egg and then dip both sides into the breading mixture to coat. Set aside on a clean plate and season with salt and pepper. Place a large skillet over medium-high heat and add in the olive oil. Once oil heats, add in the chicken and cook for 3 minutes, flip and cook for another 3-5 minutes or until cooked all the way through. Remove and transfer to a plate, leaving in all the juices. Immediately add in the lemon juice, stock and capers. Bring to a boil and scraupe up the brown bits from the pan. Add the chicken back to the pan and simmer for 5 minutes. Remove the chicken and transfer to a platter. Stir in the parsley to the sauce and remove the pan from heat. 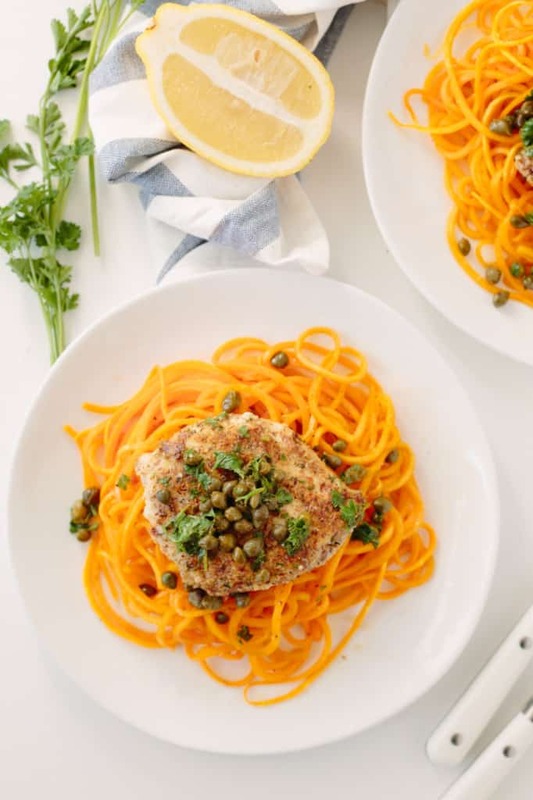 Divide the finished butternut squash noodles into four plates or bowls and top with chicken. Pour over extra sauce from the pan. Serve immediately. Did you peel and chunk up the squash in order to spiralize it? Looks delicious! 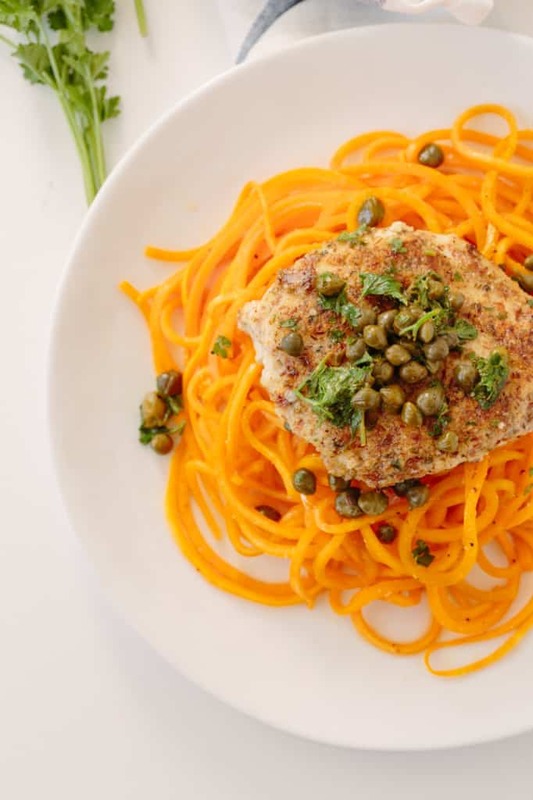 Would this baking method also work with spiralized sweet potatoes? Thanks! 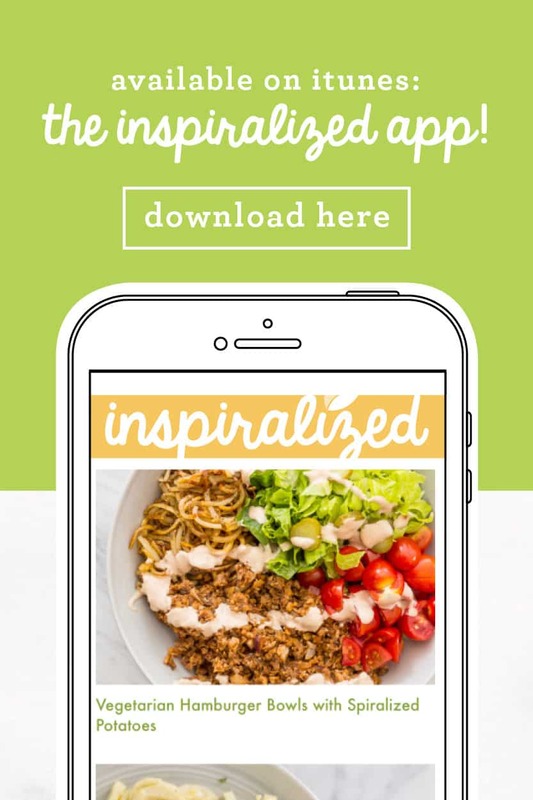 sorry, the INspiralizer! That's what I meant! Just use whichever blade on your current model that mimics the same shape noodles as you see in the picture! Loved this recipe. The squash was a bit hard to conceptualize, but it was worth it. Yum. I made this tonight and it was delish Had trouble spiralizing the squash. Is it the Paderno that I bought before your product came out? The squash was so hard that the plastic prongs couldn't hold it no matter how hard I pushed it toward the blade. I ended up with not enough noodles and a lot of wasted squash. Great tasting recipe. Loved the almond flour. Let me know about the squash problem as I think that somewhere I read of others having trouble with the Paderno..
Another delicious recipe!! Thanks, Ali!!! I had the same issue with that model, although when I cut the top section in half lengthwise, it worked better. 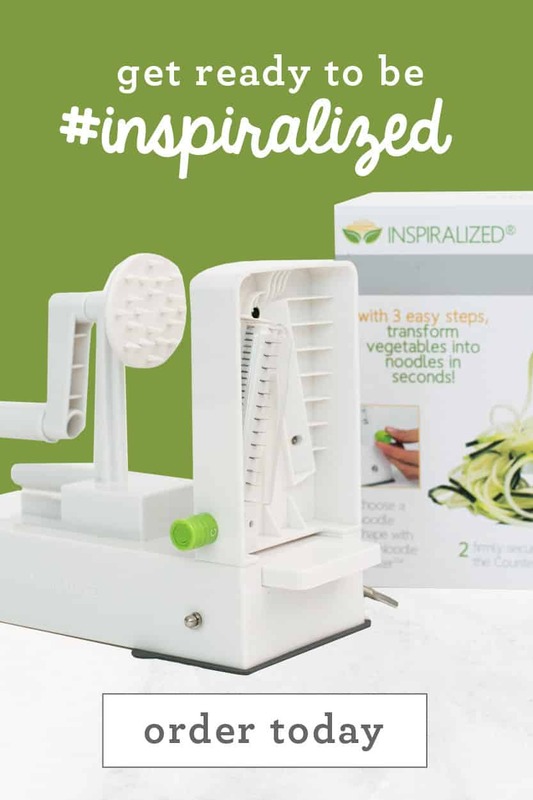 Nevertheless, I don't need the machine sliding all over and shreds of squash littering the kitchen, so I just purchased the Inspiralizer today. By the way, if you have pets, gather up the shreds and stray ends, chopped them fine, add some low sodium chicken broth, microwave for a couple of minutes, add to their dinner. 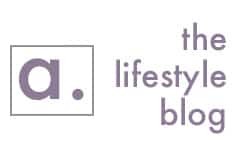 Very good for them, tasty, less waste, and everyone stays healthy and happy! Have to improvise with the chicken. Oddly, I have almond meal but lack capers and have only 1/2 lemon. Since I do have lots of clementines, some pitted, brined black and green olives, and a vivid imagination, I'm sure that it'll be tasty. 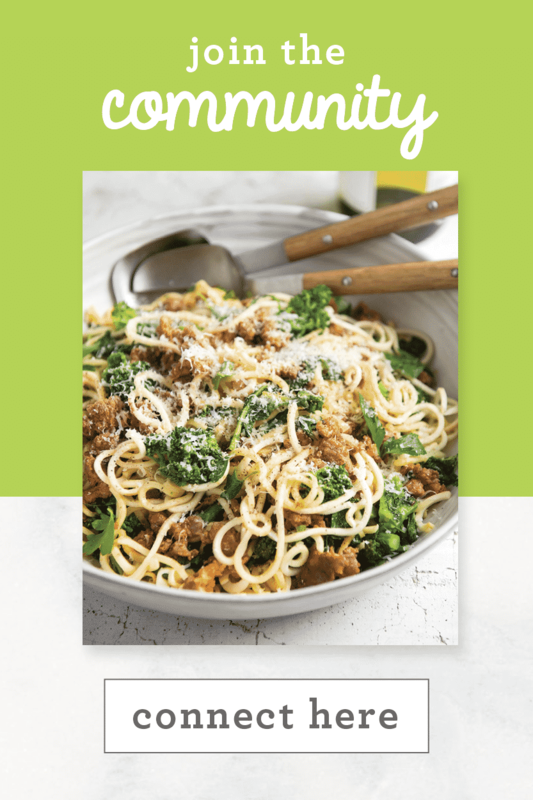 Thank you for the cookbook, just discovered the blog when I decided to get the more efficient and effective spiralizer. The other model is great for less challenging veggies, and probably for apples and pears, too. But I love the squash recipes. ..
Er, of course I sliced the top of the squash in two. 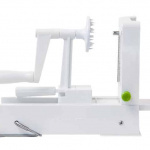 Not the other model of spiralizer, which looks pretty sturdy. .. Thanks for sharing, Cathy! Great tip for pets! Try coconut flour or, possibly, arrowroot. I found both at Wal-Mart super centers, by the way. This recipe is definitely worth trying. I made it last week. Didn't have capers, did have Greek olives, which I minced. Only had 1/2 lemon so I added juice from 2 clementines. Used sweet potato noodles. Terrific! It's a pretty forgiving recipe, and the leftovers were great. By the way, I am having a very hard time spiralizing the butternut squash, no matter what I do to get it done. It works for a few turns, then just "spins its wheels." I tried flipping ends,, slicing a slivers from each end to keep it level, you name it. Am I spiralizer impaired? 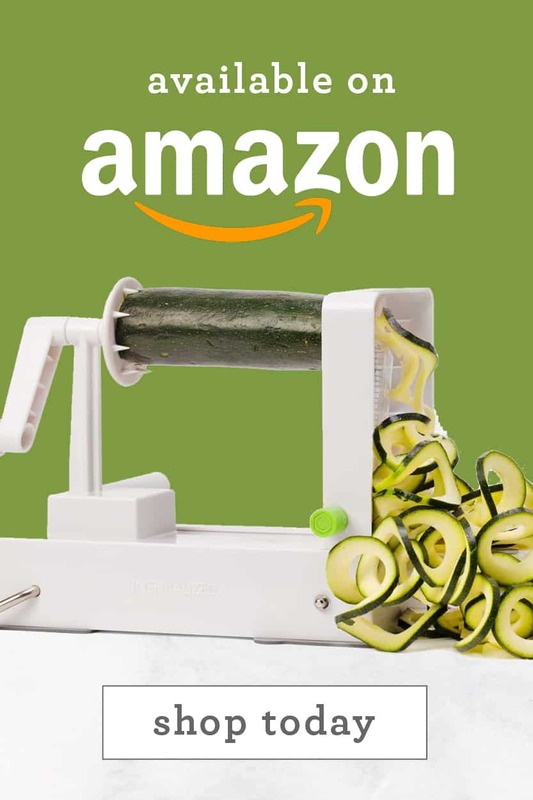 Cathy - what kind of spiralizer do you have? 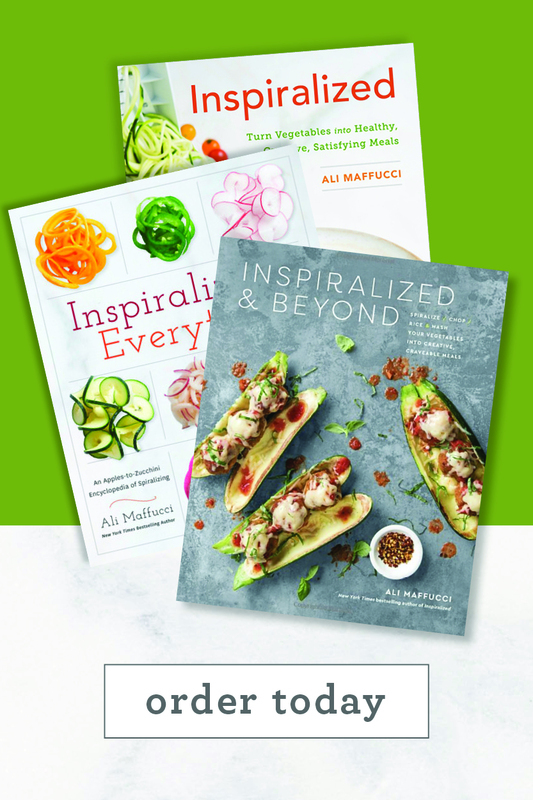 The Inspiralizer, also the , um, Padrono (sp?). I was trying to use the Inspiralizer on butternut squash yesterday (a very tasty paleo chicken on squash noodles mixed with chopped frozen collard greens and onions, with Persian spices and coconut milk sauce) and had a devil of a time with getting the squash to cooperate! I had no problems with sweet potatoes, so I was really surprised with the difficulty I had with butternut squash. If the lever was adjustable so we lefties could crank more efficiently, it might be helpful, but something was keeping the squash from engaging the blades, it just spun around, flush to the back panel. Oh my goodness!!! This was fantastic! Everyone loved it!!! And spiralizing the butternut squash was a breeze with the inspiralizer!! I love it!!! Just made this tonight and I really enjoyed it! The tartness from the lemons and capers balances out the sweetness of the squash so nicely. Easy to prepare and so delicious. Will definitely be making this again! I had the same problem as Cathy tonight, and I was using my brand new Inspiralizer. The prongs wouldn't stay in the squash which would stop it from engaging with the blades. I was disappointed. Any tips?